Cupping is a form of ancient Chinese medicine that involves creating suction at various points on the body, including the belly button. The therapy is used to treat a variety of health conditions, including asthma, digestive disturbances, skin disorders and poor circulation. Talk with your doctor before integrating cupping as part of treatment for any health condition. Cupping is performed with glass jars, heated with an alcohol-soaked cotton ball lit on fire. This removes the oxygen from the cup, creating a vacuum that seals the cup to the skin around your belly button. More fire creates a stronger level of suction. The jars are left in place for five to 15 minutes before being removed. Some practitioners of cupping place a small amount of oil around the lip of the jar so it can be moved around your navel during treatment. Others will place a series of jars on or near your belly button. The theory behind cupping is that the suction created by the glass jars relieves stagnated blood and disperses your internal heat, which proponents of traditional Chinese medicine, or TCM, believe controls your overall health. 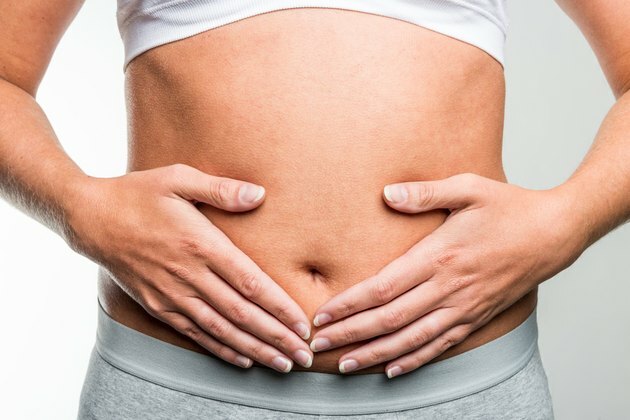 Cupping of the belly button may improve digestion by increasing the flow of digestive juices and absorption of nutrients. It is also believed to stimulate the digestive process by regulating movement of the organs involved in digestion. Dysentery, diarrhea and gastritis are conditions treated by applying cups to the belly button area. Cupping may also provide pain relief and improve breathing. Cupping is a form of alternative medicine and is not regulated to the degree that traditional medicine is. If you'd like to pursue cupping as part of your treatment, seek out a licensed practitioner with experience cupping the navel area. Always talk with your doctor before beginning cupping; he may be able to provide a reputable referral. Before undergoing the treatment, ask about cleaning and hygiene standards to ensure that you won't be treated with unwashed equipment. If you feel uncomfortable or a practitioner is reluctant to answer your questions, find a different one. Cupping of your belly button should never replace any medications or treatments ordered by your doctor. The treatment does carry some risks. Understanding them helps you prepare for your session. The suction created by the cups brings blood to the surface of your skin, increasing the risk of blood clots. Walking around afterward may reduce the chances that you will develop one. Pregnant women should not undergo cupping unless approved by their obstetrician. Cupping leaves large red marks on your belly button area, something to consider if you plan to bare your stomach area for any reason. Some people report pain in the areas that were cupped.